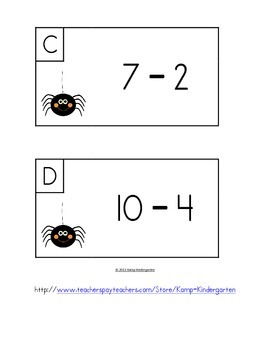 This resource provides fun and exciting activities for learners to practice subtraction facts to 10. This packet has 5 sets of Subtract the Room equation cards. Each set has 10 cards. There is a recording page for each set of cards. The cards and recording pages have matching Halloween Friends themed graphics. 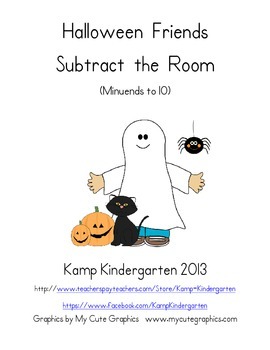 Halloween Friends Subtract the Room can be used for Halloween, autumn/fall, spider, cat, or jack-o-lantern themes. IMPORTANT! Please be aware that Halloween Friends Subtract the Room is not intended for classrooms and learners who do not observe Halloween. 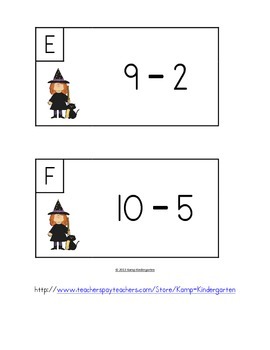 Print, laminate, and cut out the equation cards. Make copies of the recording pages. Hang the cards in places all around the room. Give each student a clipboard, pencil, and recording page. Learners search the room for cards with equations. When they find a card, they write the equation and difference in the correct space on the recording sheet. 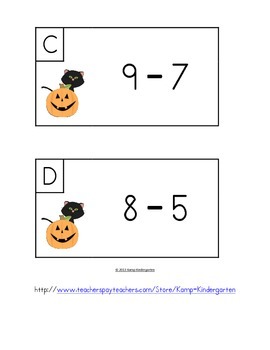 This resource helps learners develop subtraction fluency and supports the Math Common Core Standards for Operations and Algebraic Thinking. Thank you for looking at this packet I hope you and your learners enjoy these activities. Please click on the links below to view other Halloween themed resources you may enjoy.